Habit: Perennial herb, in soil or rock crevices; rhizome generally short-creeping, suberect, or erect, scales large, generally tan to brown, generally uniformly colored. Leaf: generally tufted, 5--200+ cm, generally +- alike; stipe generally firm, base generally darker, with many vascular strands; blade 1--4-pinnate, often with scales, hair-like scales, hairs (except clear, needle-like hairs generally 0), or short-stalked glands on axes, between veins or not, veins free to netted; rachis, costa generally grooved adaxially. Sporangia: sori round, along veins; indusia peltate or round-reniform; spores elliptic, winged, ridged, or spiny, scar linear. Genera In Family: +- 40--45 genera, > 1600 species: worldwide, especially tropics, wooded areas. Note: Based on molecular sequence data, Athyrium, Cystopteris, Woodsia removed to Woodsiaceae to preserve a monophyletic Dryopteridaceae. Unabridged Note: Current data (as reported by Schuettpelz & Pryer and in papers cited therein) suggest that Wooodsiaceae is paraphyletic (with respect to Aspeniaceae, Blechnaceae, and Thelypteridaceae), yet are insufficient to resolve the questions of circumscription (too few taxa, not enough genes sampled). Alternative classifications that would preserve monophyly include recognition of several additional, small families (e.g., Cystopteridaceae, Athyriaceae, and others not in California, each comprising just a few genera) or lumping at least 4 currently recognized families, many of long-standing use and acceptance; a conservative and expedient course is taken for now (Smith et al. 2006), pending further work. Habit: Rhizome generally suberect to erect, often stout. Leaf: stipe stout, firm, generally densely scaly, ×-section with many round vascular strands in an arc; blade 1--3-[> 3--]pinnate, proximal pinnae reduced or not, thin to leathery, scaly, veins generally free, rarely +- jointed; pinna bases often wider acroscopically; teeth, generally including bristle-like tips, < 4 mm [or teeth 0]. Sporangia: sori round; indusium peltate [0 or reniform], sinus 0. Leaf: stipe generally 1/5--1/2 blade, base scales +- 2--3 mm wide, lanceolate, those above proximal pinnae generally < 1 mm wide, falling early; blade narrow-lanceolate to -elliptic, 1-pinnate. Sporangia: indusium +- entire to toothed. Chromosomes: 2n=82. Note: Some plants from Butte, Tehama cos. difficult to assign to subsp. Hybridizes with Polystichum dudleyi (forming both sterile diploids and fertile allotetraploids called Polystichum californicum), Polystichum lemmonii (forming fertile allopolyploids called Polystichum scopulinum), Polystichum munitum. 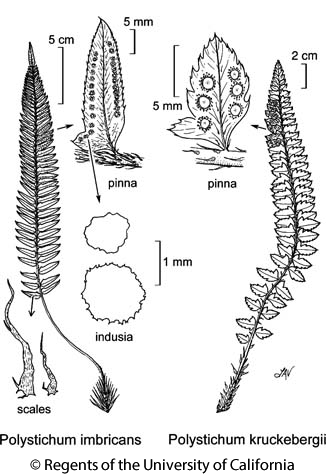 Citation for this treatment: Alan R. Smith 2012, Polystichum imbricans, in Jepson Flora Project (eds.) Jepson eFlora, http://ucjeps.berkeley.edu/eflora/eflora_display.php?tid=39415, accessed on April 21, 2019.